It’s still hard to believe that TC Electronic’s groundbreaking PolyTune was released only a few short years ago. The PolyTune redefined what a guitar tuner pedal could be with innovative polyphonic tuning and has since become the new industry standard for many guitarists. Now the TC Electronic PolyTune 2 aims to raise the standard yet again, breaking the mold of an already excellent tuner and leaving competitors further behind. 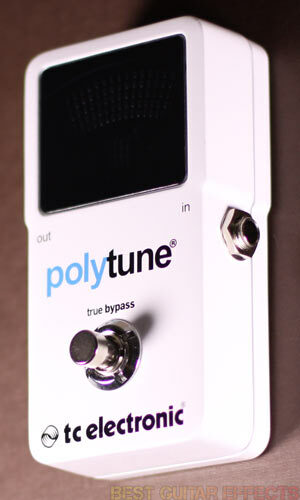 The PolyTune 2 brings some exciting new features to the now legendary tuning pedal. While the 100+ LEDs on the original PolyTune were already pretty bright, the PolyTune 2 features even brighter “retina-scorching” LEDs and an ambient light sensor for greater visibility on dark stages or at daytime gigs. There’s also an all-new strobe tuning mode that features ultra-precise +/- 0.1 cent tuning accuracy. For demanding guitarists who require extreme precision from their tuner, the PolyTune 2’s new strobe tuning feature may be worth the price of admission alone. A classic seemingly made better without messing with the formula that made the original success, the PolyTune 2 may just be the best guitar tuner pedal around. Let’s run down this pedal’s features in detail before jumping into our TC Electronic PolyTune 2 review. Visit TC Electronic for more info about the PolyTune 2. The original PolyTune, now referred to by TC Electronic as the PolyTune Classic, is the foundation on which the PolyTune 2 is built. When in needle tuning mode the PolyTune 2 provides the same great +/- 0.5 cent tuning accuracy that’s on par with the very best needle style tuning pedals including the PolyTune Classic. And the paradigm-shifting polyphonic tuning that debuted in the PolyTune Classic is still in tact as before. If you’ve tried the PolyTune Classic, this pedal functions just as before in this regard. If you’re new to all things PolyTune, you’re in for a treat as the PolyTune 2 is one of the most simple and effective tuners available. The PolyTune 2’s polyphonic tuning mode is activated simply by strumming the open strings of your guitar and provides a quick way to see if any strings need fine tuning adjustment. 6 twin columns of green and red LEDs indicate whether or not the 6 strings on a standard guitar (or 4, 5, or 6 string bass) are in tune, sharp, or flat. If any strings are showing up outside of the green, plucking them individually will allow the PolyTune 2 to immediately switch to the preselected needle or strobe mode for precision tuning. The transition is quick and responsive and should shave off a few precious seconds when tuning between songs. While the needle tuning mode offers more than enough precision for most tuning needs, the PolyTune 2 takes it even further with the all-new strobe tuning mode. TC Electronic went above and beyond with the PolyTune 2’s strobe tuner for super accurate +/- 0.1 cent tuning, unheard of in a pedal tuner under $100 until now. The strobe tuner is great for guitarists demanding the best in pitch perfection during live sets. This extreme precision also comes in handy if you like to set the intonation of your guitars yourself instead of relying on a guitar tech for the job. You can also use the the strobe tuner in combination with polyphonic tuning, giving the strings a quick strum to see which ones are out of tune and then plucking individual strings to let the PolyTune 2 immediately jump to strobe mode for ultra fine tuning. Sometimes you may notice that when you strum the strings in polyphonic tuning mode and get all green LEDs indicating precise tuning, plucking the strings individually in strobe tuning mode may still reveal slight tuning imperfections. This is a testament to the strobe tuner’s extreme accuracy. Some guitarists may even forgo using polyphonic tuning altogether in favor of simply relying on the strobe mode’s extreme accuracy. A couple tandem features worth commenting on are the PolyTune 2’s new brighter LEDs and accompanying light sensor. The LEDs do seem noticeably brighter than my memory of the original PolyTune although I didn’t have a PolyTune Classic on hand for direct comparison. But putting the PolyTune 2 to the test on its own merits produced very satisfactory results. Under a blazing Los Angeles sun at noon, I fired up the PolyTune 2 outside to tune up and see just how visible the LEDs really are. I’m happy to report that the display was clearly visible and should definitely be bright enough to give you an accurate readout during any daytime gig. Indoors you’ll notice that the display is bold and vibrant yet not overly bright as the ambient light sensor seems to do its job well and adjust accordingly in various lighting conditions. The PolyTune 2 packs a lot of versatility for transposed tunings allowing you to tune down 5 semitones to B or tune up capo-style 7 semitones to B. This is easily achieved by pushing the Tuning button repeatedly to cycle to the tuning you want. Release the button for 2 seconds, and your selected tuning is saved. Want to drop-tune to D? Just press and hold the footswitch for 2 seconds. A “DROP d” message lets you know that you’re ready to go. Repeat the process to return to standard (“STD”) tuning. This is very convenient for when you just need drop D tuning for a song or two at various points throughout your set. Another button, Display, lets you cycle between the 4 tuning display modes: Guitar Needle, Guitar Strobe, Bass Needle, and Bass Strobe. It’s very easy and intuitive to figure out and use. Pushing both the Display and Tuning buttons at once lets you quickly set the PolyTune 2’s reference pitch from 435 Hz to 445 Hz. The default setting is, of course, standard tuning at 440 Hz. There’s even a power output, a convenient little addition that many guitarists have come to expect from a tuner over the years that allows you to use the PolyTune 2 to power your other guitar pedals via daisy chain up to 2000mA. If you do power the pedal with a battery, however, the battery compartment is easily accessed by a single screw beneath the pedal that can be turned with a coin or a heavy 2mm guitar pick. True bypass switching is standard on all of TC Electronic’s PolyTune pedals, maintaining the integrity of your signal when the pedal is disengaged. A mini USB connector rounds out the features in case TC Electronic releases any firmware updates. (I’m personally hoping for an added extended reference pitch down to 432 Hz sometime.) The beauty is in the little details, and TC Electronic seem to have covered just about everything this time around. For 6-string guitarists this is a tough tuner to beat at this price. The PolyTune 2 is truly a guitar tuner to be reckoned with. With TC Electronic’s Ditto Looper, Ditto X2 Looper, HyperGravity Compressor, and Flashback Mini Delay being essential modern pedals, the PolyTune 2 is another instant classic. Let’s see the final result. The PolyTune 2 is every bit as good as fans of the Original PolyTune have come to expect while changing the game yet again with an extremely precise strobe tuning mode. The PolyTune 2’s new brighter LEDs with an ambient light sensor ensure clear visibility under any playing condition. It’s a breeze to use and will give you years to reliable tuning. TC Electronic have done it again. 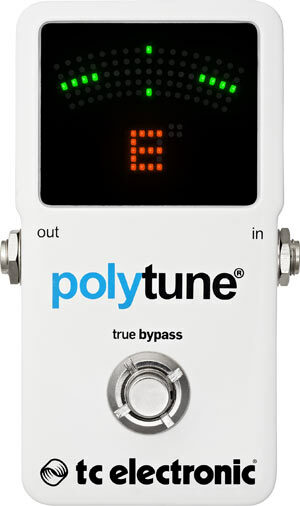 The PolyTune 2 is easily the best guitar tuner pedal in it’s price range. That concludes our TC Electronic PolyTune 2 review. Thanks for reading. 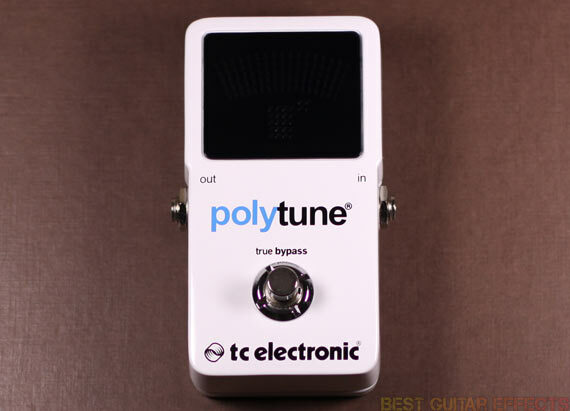 Want to buy the TC Electronic PolyTune 2?